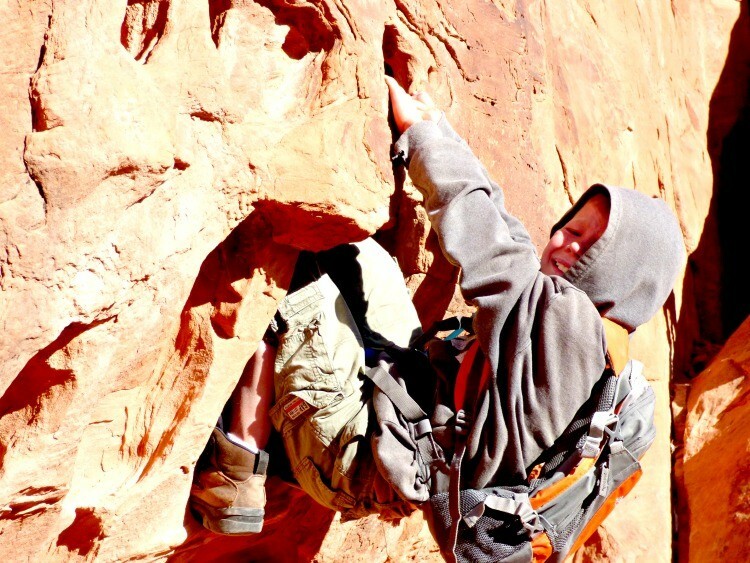 Moab, Utah, is the adventure traveler’s Holy Grail. It is a year-round sports mecca, offering whitewater kayaking and rafting, mountain biking, hiking, climbing, four-wheeling, camping, dirt biking, canyoneering, bouldering, even sky diving and more. 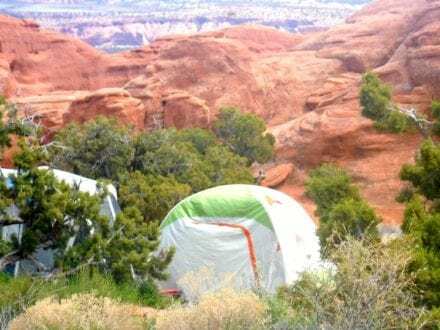 Because of this, Moab is one of the most amazing destinations for an unplugged family camping trip. A place where you can leave the electronics at home, and actually have the kids forget they even exist. 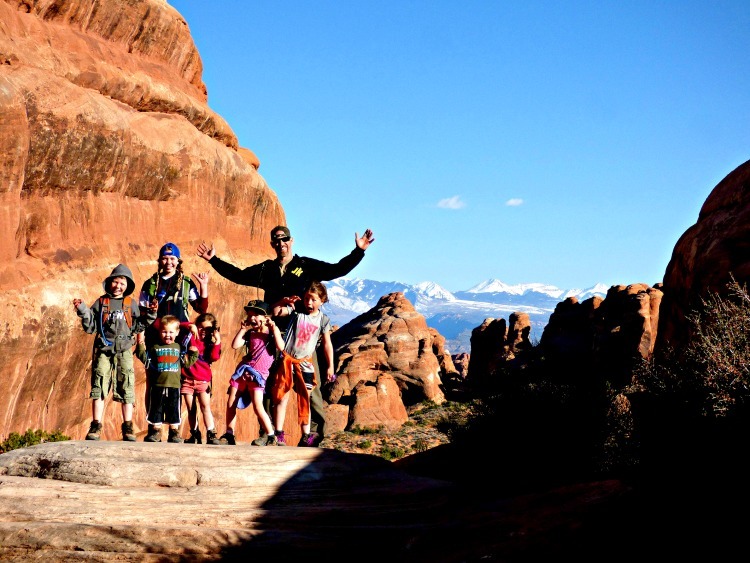 Family camping in Moab, UT gives your entire family the opportunity to revel in all things family and adventure and make long lasting memories. 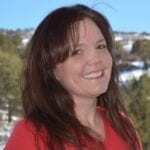 My family and I love Moab, Utah, so much, we make a point to travel there every year, sometimes several times and we never ever are at a loss for amazing adventures. We typically go a little crazy and seriously push our limits. We enjoy some truly wild adventures, like paddling Cataract Canyon and biking Slick Rock as our first mountain biking trail. We’ve also found ourselves in some less than desirable situations, such as hiking a trail marked “extreme” on a whim without being properly prepared, arriving and finding absolutely NO place to camp, as well as camping in the craziest storm and having our tents completely fall apart in the middle of the night. 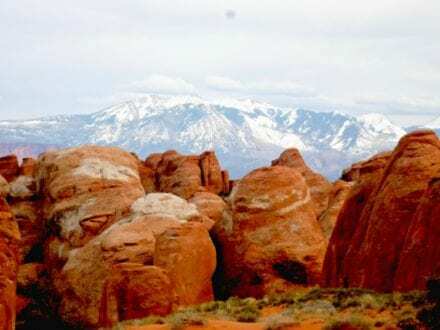 In addition, the fact that both Canyon Lands National Park and Arches National Park are located in Moab, seriously makes it one of the top travel destinations for families looking for adventure. No matter what your interests and passions, there is no doubt Moab would make the perfect camping vacation spot for your family! Great weather, coupled with endless fun always spells a memorable and fun time for families! That said, there are things you should know before heading out into the desert for a trip of family camping in Moab! 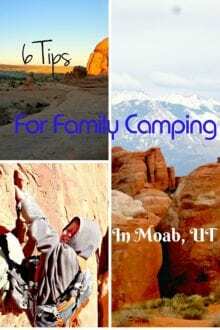 We’ve learned some of the best lessons the hard way and are hoping that the following tips for camping in Moab can save you a lot of headache and stress. Camping in Moab, UT is one of my favorite things to do. The stars, the air, the absolute peace… it is incomparable! Photo Credit: Susie Kellogg, Unstoppable Traveling Mom. Family camping in Moab is incomparable, in my opinion. The night sky is mesmerizing; in fact, we saw a satellite and countless shooting stars each night! But camping is tricky, as you either need a reservation where it’s allowed, or you need to plan to arrive early at your desired campground to make a reservation! 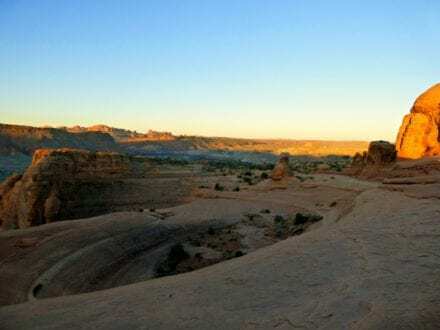 All the hype you hear about Moab is totally on point, which means it can get crowded and there is often a run on campsites as the evening nears. Campgrounds fill up rapidly, and it’s highly likely that you will roll up to countless “Campground Full” signs if you don’t plan ahead. If you are going to be hiking Arches National Park, check out Devil’s Garden located within the Park. Reservations can be made, and typically are, six months in advance. No walk-ins allowed and there are no showers. If you will be taking advantage of the Sand Flats Recreational Area, defintely plan to arrive early, as these sites are allocated on a first serve basis and are very very popular! Packing for Moab pretty much means packing for two seasons. Moab is a desert and the nights can be cold, even in the summer. Sleeping bags are definitely a good idea, especially for younger kids. And packing clothing to stay comfortable is as easy as packing layers. Fleece, long sleeve shirt, short sleeve shirt, pants and shorts…like I said – two seasons! Also, Moab is ripe with cactus and other prickly plants, not to mention a tremendous amount of dust and dirt, so hiking shoes are a much better bet than sandals. In fact, just leave open shoes home. You can never have enough water, especially out in the middle of the desert. But do not fear, you don’t need to pack dozens of five gallon jugs and cart them into Moab. Nooooo, throw those jugs in the back of your vehicle and don’t worry about a thing because there is an amazing place called GearHeads that provides FREE filtered water! Free. Filtered. Water. We fill up our five gallon jugs, our CamelBaks, our water bottles all for free. And, if you happen to be interested in some outdoor gear, it just so happens GearHeads, conveniently located next to City Market on Main Street, sells just about anything you could need. From Dutch ovens to hiking shoes, they have you covered! Moab is the desert. The months of April through September are hot and the sun scorches everything it shines upon. Being prepared is your best defense against the elements. Obviously bring plenty of sunscreen and reapply every few hours to protect your skin from burns. Wearing a hat to create shade around your face and neck can’t hurt either. If you are particularly sun sensitive, a very light long sleeve shirt will give you that extra protection your body needs. In addition, you should start your day early as temperatures in the early morning are absolutely perfect for hiking or biking or climbing. In fact, there may even be a slight chill in the air. Choose the trails or routes with the shade for later and hit the full sun activities as early as you can!! One of the most beautiful experiences of my life was watching the sun rise in July. We awoke at 3:30 a.m. and made the one hour drive (from our campsite) to the trailhead of Delicate Arch, then hiked the 1.5 mile hike to Arches icon, Delicate Arch. Watching my first sunrise (I’m not a morning person) in such a beautiful spot literally moved me to tears. I’d been through something devastating a few weeks prior and this was the beginning of my healing. I’ll never forget it. Now I’ve heard that Delicate Arch at sunset is even more beautiful and since sunset is more my speed, when we are in Moab next, you can bet I’ll be there, reveling in God’s beauty! * Quick little bit: Arches National Park is free this early in the morning, no one is manning the gate! Moab is a child’s playground. 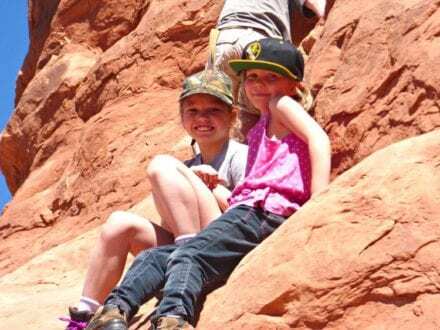 They get dirty, they climb things, they see lizards, they learn so much about science, rock formations, desert climate, petroglyphs, microbiotic crust and so so so much more. Moab is a place of adventure and exploration. It is the perfect unplugged vacation for families to rekindle their love of the outdoors and for each other. As a full time traveling family, if we were asked to name our favorite locale, we would all say, Moab! It’s that great … for everyone. 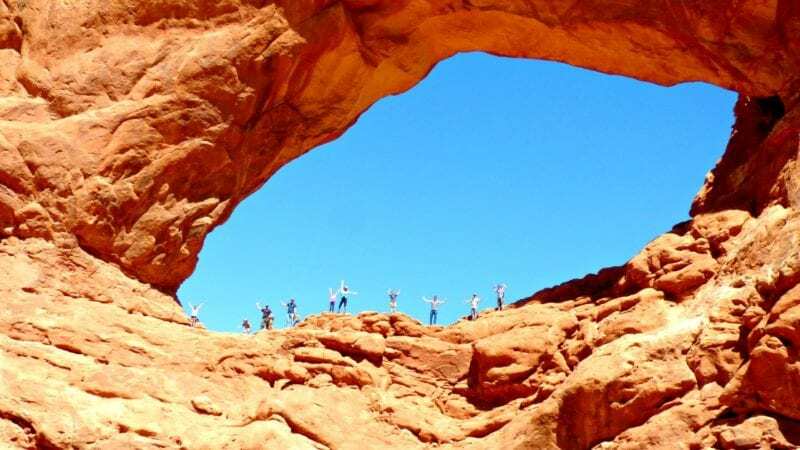 Take a tour with any of the plethora of tour companies, go four-wheeling, take a hike, a bike ride, go climb some rocks, go fish, jump in the river, whatever your fancy, it’s in Moab!